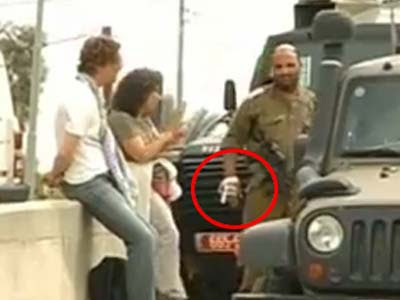 The Muqata: "It All Started When an Israeli Officer Hit the Man Who Broke his Fingers"
"It All Started When an Israeli Officer Hit the Man Who Broke his Fingers"
Minute 1:51 of the ISM video clearly shows Lt.-Col. Shalom Eisner’s bandaged hand, after his fingers had been broken by an agent provocateur. After so many incidents in which Palestinian propaganda has managed to rearrange the narrative so that the Israeli side appears to be the aggressor, we could expect the IDF brass, as well as Israel’s government, to show restraint, perhaps count to 30, before throwing their own man under the media bus. But, alas, both IDF Chief of Staff Benny Gantz and Prime Minister Benjamin Netanyahu condemned a senior IDF officer for the way he appears on a selectively edited Palestinian video on You Tube. A picture, in this case, is worth a whole lot less than a thousand words, because the picture is a video, and a video can be edited so that the aggressor appears like the innocent victim. A large group of 250 European and Palestinian activists belonging to the International Solidarity Movement (ISM) were on a bicycle trip in the Jordan Valley, a region which has enjoyed relative peace in the relationship between local Arabs and the IDF, even as Judea and Samaria were ignited in violent clashes. In other words, this is the equivalent of the Sinn Féin, the political wing of the IRA. While Palestinian terrorists are engaged directly in executing acts of murder against Jews in Israel and abroad, the ISM creates provocation that helps divert media attention from the brutality of Palestinian terrorism. This very large group of dedicated agents provocateurs rode through one of the villages in the valley, and when they tried to get on highway 90, which runs the length of Judea and Samaria alongside the Jordan River, they encountered Israeli soldiers and border policemen who demanded their return to the village, because the activists had not coordinated their trip with security forces. It should also be noted that, as the ISM itself states this plainly, it is their mission to open up those road blocks, so that “the Palestinian popular resistance,” e.g. the Islamist Jihad and Al Fatah, be able to renew their attacks on Jewish targets. Now you understand what the clash at the entrance to highway 90 was all about. Minute 1:51 of the ISM video clearly shows Lt.-Col. Shalom Eisner's bandaged hand, after his fingers had been broken by an agent provocateur. According to the Deputy Commander of the Valley Brigade, Lt.-Col. Shalom Eisner, the event, in which IDF soldiers were trying to block the passage of 250 cyclists, lasted about two hours, only a few minutes of which are shown in the video. At some point during that two-hour event, an ISM agent attacked Eisner, and broke two of his fingers. Take a look at the way the Israeli officer is holding his weapon, and you’ll realize he is actually responding to a dangerous demonstrator, rather than attacking him unprovoked. He was provoked and then some. So far, this is a tale of two opposing groups, each attempting to perform the task it had been assigned by its bosses: the ISM were trying to push through the IDF checkpoint, and the IDF was working very hard, and, considering the event lasted two hours, with considerable self-restraint, to block their advance. Now comes the part where on the Israeli side the bosses lose their grip and throw their dedicated soldiers under the bus. There have been countless (and I mean, countless) episodes of IDF and Police officers violence towards settlers and right wing demonstrators (who didn't first break the fingers of the IDF/policemen first), and yet never once did I hear Israel's Prime Minister state that the IDF behavior was "not in accordance with the spirit of the IDF." The officer should be thrown out of the army. All you religious settlers are the same militant and occupying garbage. Since the goal of the ISM is to destroy Israel, if one needs the ISM forever, that means they will continue to fail in their goal. But they would make Joseph Goebbels proud. 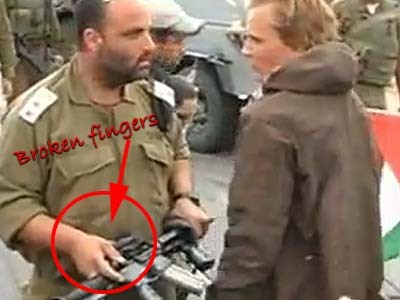 There were no other soldiers available, that the commander had to personally confront these guys, even with broken fingers? Looks to me that there were quite a few other soldiers standing around. Normally, I'd give the IDF the benefit of the doubt, but this story does not make sense. Arrest the Danish pagan and sentence him to clean toilets in Yad Vashem for 5 years. Something is pathetic when you consider how a nation can overnight throw out its native culture for not just a daughter religion of another nation, but a dumbed down, simplified and paganized version. If Danes and other heathens worship a dead Jew on a stick as G-D , doesn't that make us Archangels. They should bow to us and kiss our feet. After carefully examining the video It clear that Eisner was justified. The activists were requested to move back. One of them got to close and stared down an army officers in a threating way. We are trained to act quickly and efficiently and sometimes we only have a split second to make a decision. The officer felt that he was threaten and we should support him as he was in the field and no one knows what he was thinking except for him. should have a webcam running on their uniforms at all times. 99% of the time the video can be safely deleted, but the other 1% of the time it is the only way of saving Israel from diplomatic defeat. In the Operation Defensive Shield, the second Lebanon war, Cast Lead, the flotilla, this incident, and a thousand others, Israel's enemies could only win by delegitimizing us based on war crimes accusation. In each case the IDF spokesman went looking for video AFTER the fact to prove them wrong. Sometimes such video could be found, sometimes not. But why always look only after the fact? Why not prepare a little beforehand? Shlomo, this is an IDF commander. He doesn't sit on the side and bark instructions, he leads. That there were soldiers milling around after 2 hours is understandable, I admit I would find it hard to keep this up myself (I lose it with my own kids after 5 mins). Eisner's seeing that so many less professional soldiers are not doing their job would make him even more atzbani. Again, why are the commenters here talking about soldiers standing around? We do no know what else happened there besides the ISM phone video. BTW, this was on Shabbat. Eizner did actually succeed in his mission, the protest and blockage of the highway was prevented. The PM, pres., and anonymous army blabbers are a disgrace for taking part in the media lynch. Something went wrong and Eizner should not have lost his cool, but the lynch is way out of proportion and completely unbalanced to the numerous times Israelis are beaten by police and the army. I ardently support the IDF, but I believe that what this soldier did was wrong. You don't need to be a lawyer to know that you can't hit one demonstrator because a different demonstrator broke your finger an hour earlier. I read a wonderful biography of Martin Luther King which pointed out that the only reason the civil rights marches were successful was because the police in Alabama overreacted and attacked the demonstrators, and that was broadcast on national TV. MLK was praying that the police would attack. The Civil Rights Act was enacted because of the national reaction to what they saw on their TV screens. This soldier should have known better. Any way to send Eisner a gift of recognition ? "Flytilla activists" -- Morons or Thugs?